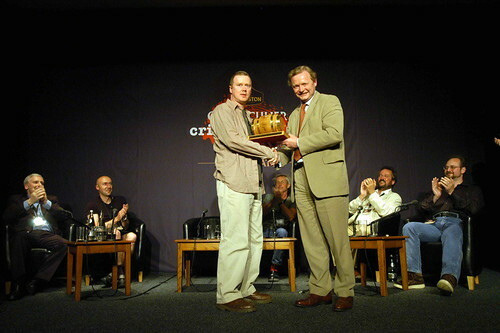 TOP Award Allan Guthrie Simon Theakston044.jpg, originally uploaded by michael_jecks. And then the winner was announced . . . and I have to admit to a moment’s regret that it wasn’t me. The car’s dying and so is my computer . . . still, Allan was a worthy winner. His first novel is excellent, taut, gripping and extremely funny, and it is very good to see someone new(ish) to the business getting the accolades. But in truth , I was pleased to know that this extremely pleasant, affable character had won for another reason. Six years ago he had tried his hand at writing with the first draft of “Two-Way Split”, and sent his entry off to the Crime Writers’ Association Debut Dagger Award. And the Organiser, so he told me, gave him so positive a write up, and was so helpful with his suggestions for improvement, that the book ended up here. And the helpful Organiser? Blast. If I’d been ruder, I might have won the prize myself! There is one other thing I have to point out. If you ever look at a picture of a man who’s just been given the death penalty, I think you’ll find that the expression is remarkably similar to Allan’s at this moment! Thanks again to Sam Atkinson for the photo. This entry was posted on Thursday, July 26th, 2007 at 7:44 pm	and is filed under Dartmoor. You can follow any responses to this entry through the RSS 2.0 feed. You can skip to the end and leave a response. Pinging is currently not allowed.